These valve guides are .100 shorter (top side) to accommodate big boy camshafts. First things first: Cycle X (Kibblewhite) cast iron guides are the best. These valve guides are .100 shorter on top to work with the biggest of Honda CB750 camshafts. The valve guide seal on conventional guides will fall into the valve stem keeper groove and cause a potential oil consumption problem with most large camshafts. Not with our guides! The valve guide has been designed and built to use a Viton "O" ring to stop oil from weeping around the outside of the guide (it happens). Not with our guides. "First and foremost I must point out that not everyone is qualified to make this comparison, unless they have access to and know how to use Vickers hardness testing equipment, and can take a specimen and view it with a high power microscope and then understand the matrix present. Further they must now how these two process are applied and react to the substrate material they are being used on." "Hard chrome plating is an adhesive process which means the chrome is “laying on and sticking to” the surface of the substrate material. Hard chrome can trap foreign material within the chrome layer and virtually turn that surface into sandpaper, which also allows the surface to become larger than intended. There is such a thing as nearly perfect chrome, which requires a double cleaning process and the diode to be a tube, which helps to create a clean even-layer of chrome. 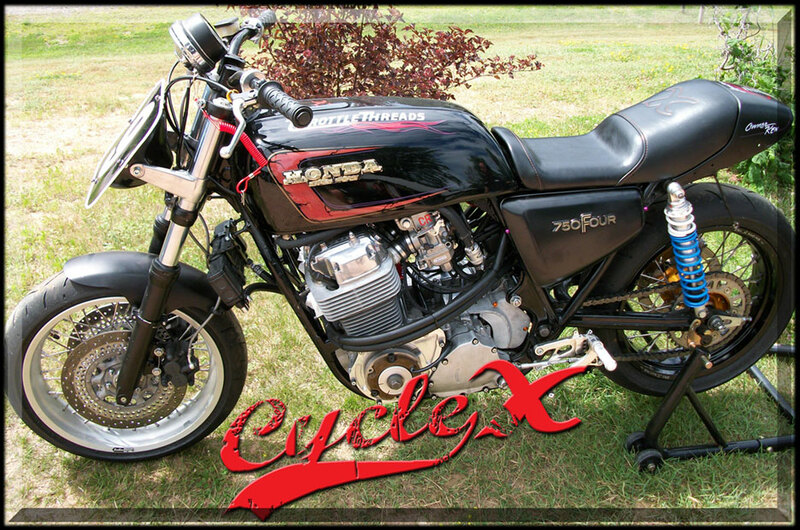 None the less, chrome can come off and is known to gall and lacks lubricity." "The KPMI® Black Diamond® coating is a process which impregnates the substrate and develops a 2-tenth layer below and above the surface that is 55-65Rc. What this means is a shell develops underneath and above the surface that is very hard and cannot come off under even the most extreme conditions. Further, there is a second process applied on top of this hard shell that produces a very low coefficient of friction, some very slippery stuff." "In the world of application, you would be foolish to consider chrome as a superior valve stem coating when compared to the KPMI® Black Diamond® Coating." Cycle X super flow valves outperform any valve on the market today. 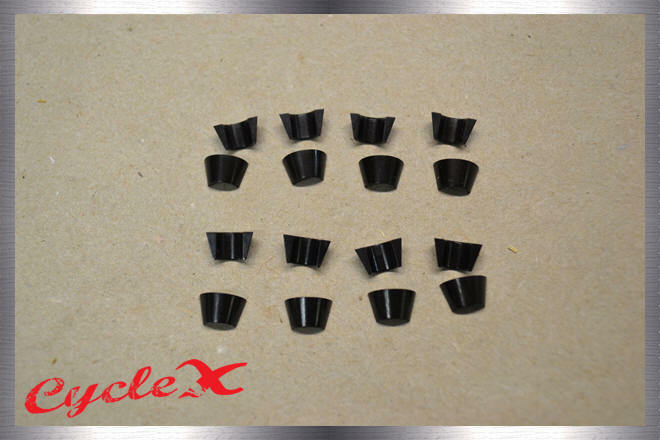 The Nitrite coating is perfect for high temperature, high RPM and run cooler. 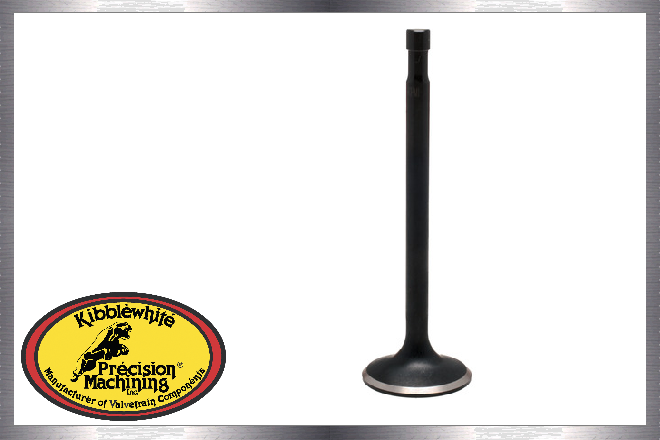 The reduced stem diameter (.033) in the port area gives our valves greater flow for noticeable horsepower gains. 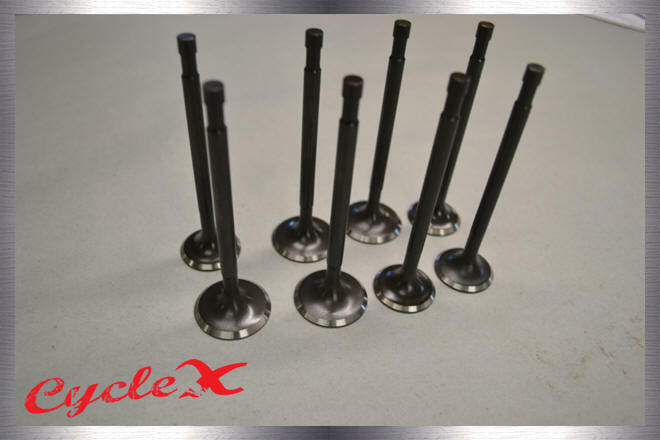 Cycle X valves are one piece forged, high nickel stainless steel alloy, swirl polished, strict tolerances and Nitride coated. Making our valves the obvious choice. The first photo shows an aftermarket valve, OEM and Cycle X valve, notice the reduced stem diameter in the port area. A complete set of Cycle X valves weighed approx. 30 grams less than the competitions racing valves. Designed for the preferred 69-76 spring retainers and keepers. All KPMI® Black Diamond™ stainless steel valves are impregnated by a special German process to a depth of .002”, with a surface build up of .0002”. This “Black Diamond™” process improves wear properties, reduces friction, and provides resistance to corrosion and wear that is superior to chrome and nickel electrolysis plating. Each valve is designed using Finite Element Analysis software, and profiles are tested on our computerized flow bench. Black Diamond™ Valves are lightweight, strong, one piece forgings with profiles that provide excellent flow characteristics. As you may or may not early style valve keepers are unavailable through Honda anymore which creates a problem if you ever lose one of these tiny things. Cycle X teamed up with Kibblewhite to reproduce these early keepers with more precision.